It's an exciting time for gaming, and as a serious gamer, it's easy to keep your focus squarely aimed at the future. A new generation of consoles is making games, in particular shooters like Titanfall, more groundbreaking than ever, and lots of other innovative projects are not far along on the horizon. All this aside, one of the cool things about progress is being able to look back and see just how far things have come. There's no doubt that the gaming landscape has changed dramatically since the 8-bit era. When you look beyond the cutting-edge visual polish and techno-wizardry, however, you might be surprised to find that many of the key ingredients that make modern shooters so much fun can be traced back to the early classics of days long past. Gaming in the mid-1970s was a completely different world. In the golden age of coin-op arcades, the idea of plunking down a dedicated video game console in your living room was only just beginning to catch on. People had personal computers they could boot games up on, but this was totally different. Atari cemented its hold on households in 1979 when it launched the VCS — later renamed the Atari 2600 — effectively bringing the proper arcade experience into homes. The Atari's eventual success paved the way for a slew of bigger and better games, and three classic arcade-to-living room ports released around this time really exemplify different aspects of the tense, twitchy vibe and high-speed strategizing that punctuates modern shooters today: Asteroids, Missile Command, and Centipede. 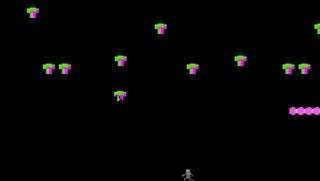 Though deceptively simple, Asteroids was one of the first major runaway hit shooters of the early arcade era. Blasting space debris in a full 360 degrees while shuffling your ever-increasing backwards velocity caused by you ship's gunfire hooked players in a big way. You had to constantly watch your back and gauge the impact of every shot to avoid a deadly collision or being picked off by wayward UFOs. Missile Command delivered a different spin on arcade shooter action, placing you in the role of a defender. Timing your explosive barrages to intercept streaking waves of incoming rockets aimed at your 8-bit base and cityscape was intense business, particularly as the game's speed and missile density increased. Shifting gears back to a more classic but no less thrilling format, Centipede's frenetic run-and-gun bug stomping threw spiders, fleas, scorpions, and other creepy crawlies into the mix. The game hurled dizzying amounts of fast-moving foes at you in a bid to overwhelm your pint-sized peashooter. These iconic games and other 8-bit shooter classics, paired with bold ideas like pushing from 2-D to 3-D, helped inform the early evolution of what would become the first-person shooter genre. Atari's unique hit Battlezone was the next major step in this ongoing evolution, as it offered one of the earliest first-person 3-D shooter experiences. This groundbreaking tank simulator even caught the eye of the US Military, who commissioned a special version to train pilots for its new Bradley Fighting Vehicle. The 8-bit scene was just the beginning. While it would be quite a few years before first-person shooters would truly catch fire and evolve beyond the early graphic limitations of the 80s, Atari's initial innovations set the tone for what was to come. A burgeoning first-person shooter revolution was imminent. To play games inspired by Atari andTitanfall, click on the banner above, or head here. This post is part of a sponsored collaboration between Titanfall and Studio@Gawker.